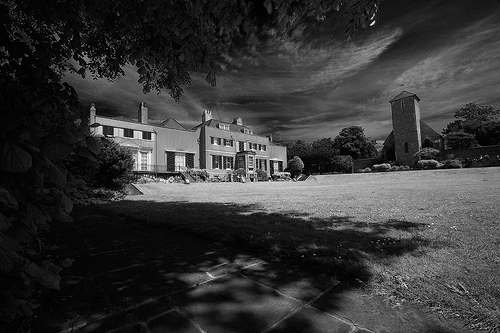 The modern building of Preston manor dates back to 1559, before this a smaller manor was in place. In 1738 the Lord of the Manor at the time, Thomas Western, demolished most of the house and re-built it with four ground floor rooms, four principal bedrooms and four semi-basement rooms. Since then several small additions have been added but the building that stands today is mainly the original rebuilt version from 1738. On the 11th of November, 1896, a seance was held were the medium claimed to receive messages from a nun called Sister Agnes who was buried outside the house, the next year when drains were being dug, human bones were found, it was reported they belonged to a woman and were dated as being 400 years old. Could this be sister Agnes? Also many sightings have been reported over the years. A Lady in Grey who descends the grand staircase with nowhere to go, And a ghost who was seen trying out a child’s toy tractor during the 1960s. Many sightings of ghostly figures have been reported by many visitors, as well as reports of doors locking themselves, lights turning off on there own, and a ghostly hand holding on to a door handle. Also a terrifying report of ghostly severed hands moving up one of the bedposts in the south west room, silk dresses being cut into diamond patterns and mysterious figures seen on the stair case's.